The datum is an imaginary vertical plane from which all horizontal measurements are taken for balance purposes, with the aircraft in level flight attitude. If the datum was viewed on a drawing or photograph of an aircraft, it would appear as a vertical line which is perpendicular (90 degrees) to the aircraft’s horizontal axis. For each aircraft make and model, the location of all items is identified in reference to the datum. For example, the fuel in a tank might be 60 inches (60") behind the datum, and a radio on the flight deck might be 90" forward of the datum. There is no fixed rule for the location of the datum, except that it must be a location that will not change during the life of the aircraft. For example, it would not be a good idea to have the datum be the tip of the propeller spinner or the front edge of a seat, because changing to a new design of spinner or moving the seat would cause the datum to change. It might be located at or near the nose of the aircraft, a specific number of inches forward of the nose, at the engine firewall, at the center of the main rotor shaft of a helicopter, or any place that can be imagined. The manufacturer has the choice of locating the datum where it is most convenient for measurement, equipment location, and weight and balance computation. Figure 1 shows an aircraft with the leading edge of the wing being the datum. Figure 1. Datum location and its effect on positive and negative arms. The location of the datum is identified in the Aircraft Specifications or Type Certificate Data Sheet. The Aircraft Specifications typically included the aircraft equipment list. For aircraft with a Type Certificate Data Sheet, the equipment list is a separate document. 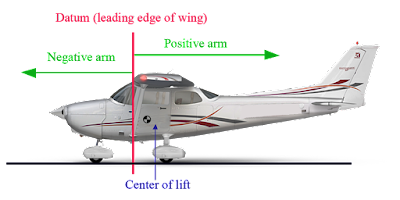 The arm is the horizontal distance that a part of the aircraft or a piece of equipment is located from the datum. The arm’s distance is always given or measured in inches, and, except for a location which might be exactly on the datum, it is preceded by the algebraic sign for positive (+) or negative (−). The positive sign indicates an item is located aft of the datum and the negative sign indicates an item is located forward of the datum. If the manufacturer chooses a datum that is at the most forward location on an aircraft (or some distance forward of the aircraft), all the arms will be positive numbers. Location of the datum at any other point on the aircraft will result in some arms being positive numbers, or aft of the datum, and some arms being negative numbers, or forward of the datum. Figure 1 shows an aircraft where the datum is the leading edge of the wing. For this aircraft, any item (fuel, seat, radio, and so forth) located forward of the wing leading edge will have a negative arm, and any item located aft of the wing leading edge will have a positive arm. If an item was located exactly at the wing leading edge, its arm would be zero, and mathematically it would not matter whether its arm was considered to be positive or negative. The arm of each item is usually included in parentheses immediately after the item’s name or weight in the Aircraft Specifications, Type Certificate Data Sheet, or equipment list for the aircraft. In a Type Certificate Data Sheet, for example, the fuel quantity might be identified as 150 gallons (gal) (+138) and the nose baggage limit as 200 pounds (lb) (−55). These numbers indicate that the fuel is located 138" aft of the datum and the nose baggage is located 55" forward of the datum. If the arm for a particular piece of equipment is not known, its exact location must be accurately measured. When the arm for a piece of equipment is being determined, the measurement is taken from the datum to the piece of equipment’s own center of gravity. A moment is the product of a weight multiplied by its arm. The moment for a piece of equipment is in fact a torque value, measured in units of inch-pounds (in-lb). To obtain the moment of an item with respect to the datum, multiply the weight of the item by its horizontal distance from the datum. Likewise, the moment of an item with respect to the center of gravity (CG) of an aircraft can be computed by multiplying its weight by the horizontal distance from the CG. A 5 lb radio located 80" from the datum would have a moment of 400 inch-pounds (in-lb) (5 lb × 8"). Whether the value of 400 in-lb is preceded by a positive (+) or negative (−) sign depends on whether the moment is the result of a weight being removed or added and its location in relation to the datum. This situation is shown in Figure 2, where the moment ends up being a positive number because the weight and arm are both positive. Figure 2. Moment of a radio located aft of the datum. Weight being added aft of the datum produces a positive moment (+ weight, + arm). Weight being added forward of the datum produces a negative moment (+ weight, − arm). Weight being removed aft of the datum produces a negative moment (− weight, + arm). When dealing with positive and negative numbers, remember that the product of like signs produces a positive answer and the product of unlike signs produces a negative answer. The center of gravity (CG) of an aircraft is a point about which the nose heavy and tail heavy moments are exactly equal in magnitude. It is the balance point for the aircraft. An aircraft suspended from this point would have no tendency to rotate in either a nose-up or nose-down attitude. It is the point about which the weight of an airplane or any object is concentrated. Figure 3 shows a first class lever with the pivot point (fulcrum) located at the center of gravity for the lever. Even though the weights on either side of the fulcrum are not equal, and the distances from each weight to the fulcrum are not equal, the product of the weights and arms (moments) are equal, and that is what produces a balanced condition. Figure 4-3. Center of gravity and a first class lever. - the heaviest weight to which an aircraft can be loaded while it is sitting on the ground. This is sometimes referred to as the maximum taxi weight. - the heaviest weight an aircraft can have when it starts the takeoff roll. The difference between this weight and the maximum ramp weight would equal the weight of the fuel that would be consumed prior to takeoff. - the heaviest weight an aircraft can have when it lands. For large wide body commercial airplanes, it can be 100,000 lb less than maximum takeoff weight, or even more. - the heaviest weight an aircraft can be loaded to without having any usable fuel in the fuel tanks. Any weight loaded above this value must be in the form of fuel. The empty weight of an aircraft includes all operating equipment that has a fixed location and is actually installed in the aircraft. It includes the weight of the airframe, powerplant, required equipment, optional or special equipment, fixed ballast, hydraulic fluid, and residual fuel and oil. Residual fuel and oil are the fluids that will not normally drain out because they are trapped in the fuel lines, oil lines, and tanks. They must be included in the aircraft’s empty weight. For most aircraft certified after 1978, the full capacity of the engine oil system is also included in the empty weight. Information regarding residual fluids in aircraft systems that must be included in the empty weight, and whether or not full oil is included, will be indicated in the Aircraft Specifications or Type Certificate Data Sheet. Other terms that are sometimes used when describing empty weight include basic empty weight, licensed empty weight, and standard empty weight. The term “basic empty weight” typically applies when the full capacity of the engine oil system is included in the value. The term “licensed empty weight” typically applies when only the weight of residual oil is included in the value, so it generally involves only aircraft certified prior to 1978. Standard empty weight would be a value supplied by the aircraft manufacturer, and it would not include any optional equipment that might be installed in a particular aircraft. For most people working in the aviation maintenance field, the basic empty weight of the aircraft is the most important one. The empty weight center of gravity for an aircraft is the point at which it balances when it is in an empty weight condition. The concepts of empty weight and center of gravity were discussed earlier in this site, and now they are being combined into a single concept. One of the most important reasons for weighing an aircraft is to determine its empty weight center of gravity. All other weight and balance calculations, including loading the aircraft for flight, performing an equipment change calculation, and performing an adverse condition check, begin with knowing the empty weight and empty weight center of gravity. This crucial information is part of what is contained in the aircraft weight and balance report. To determine the useful load of an aircraft, subtract the empty weight from the maximum allowable gross weight. For aircraft certificated in both normal and utility categories, there may be two useful loads listed in the aircraft weight and balance records. An aircraft with an empty weight of 900 lb will have a useful load of 850 lb, if the normal category maximum weight is listed as 1,750 lb. 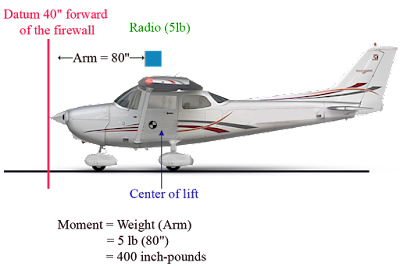 When the aircraft is operated in the utility category, the maximum gross weight may be reduced to 1,500 lb, with a corresponding decrease in the useful load to 600 lb. Some aircraft have the same useful load regardless of the category in which they are certificated. The useful load consists of fuel, any other fluids that are not part of empty weight, passengers, baggage, pilot, copilot, and crewmembers. Whether or not the weight of engine oil is considered to be a part of useful load depends on when the aircraft was certified, and can be determined by looking at the Aircraft Specifications or Type Certificate Data Sheet. The payload of an aircraft is similar to the useful load, except it does not include fuel. A reduction in the weight of an item, where possible, may be necessary to remain within the maximum weight allowed for the category in which an aircraft is operating. Determining the distribution of these weights is called a weight check. There are times when an aircraft will have a weight and balance calculation done, known as an extreme condition check. This is a pencil and paper check in which the aircraft is loaded in as nose heavy or tail heavy a condition as possible to see if the center of gravity will be out of limits in that situation. In a forward adverse check, for example, all useful load in front of the forward CG limit is loaded, and all useful load behind this limit is left empty. An exception to leaving it empty is the fuel tank. If the fuel tank is located behind the forward CG limit, it cannot be left empty because the aircraft cannot fly without fuel. In this case, an amount of fuel is accounted for, which is known as minimum fuel. Minimum fuel is typically that amount needed for 30 minutes of flight at cruise power. For a piston engine powered aircraft, minimum fuel is calculated based on the METO (maximum except take-off) horsepower of the engine. For each METO horsepower of the engine, one-half pound of fuel is used. This amount of fuel is based on the assumption that the piston engine in cruise flight will burn 1 lb of fuel per hour for each horsepower, or 1⁄2 lb for 30 minutes. The piston engines currently used in small general aviation aircraft are actually more efficient than that, but the standard for minimum fuel has remained the same. For example, if a forward adverse condition check was being done on a piston engine powered twin, with each engine having a METO horsepower of 500, the minimum fuel would be 250 lb (500 METO Hp ÷ 2). For turbine engine powered aircraft, minimum fuel is not based on engine horsepower. If an adverse condition check is being performed on a turbine engine powered aircraft, the aircraft manufacturer would need to supply information on minimum fuel. When aircraft are placed on scales and weighed, it is sometimes necessary to use support equipment to aid in the weighing process. For example, to weigh a tail dragger airplane, it is necessary to raise the tail in order to get the airplane level. To level the airplane, a jack might be placed on the scale and used to raise the tail. Unfortunately, the scale is now absorbing the weight of the jack in addition to the weight of the airplane. This extra weight is known as tare weight, and must be subtracted from the scale reading. Other examples of tare weight are wheel chocks placed on the scales and ground locks left in place on retractable landing gear.